Visitors to Muckross House in Killarney are amazed at the size of the huge antlers hanging in the main hall. This specimen belongs to one of Ireland´s now extinct animals, the Irish Elk. Its huge antlers measured as much as 14 feet (4.3m). It seems to have died out about 6,000 years ago. Bears existed here until 800 B.C., a bear´s tooth has been found in the sandhills at Castlegregory. Wild boar survived until the 1600´s and from excavations of various sites, seems to be have been widespread throughout the country. Wolves were also common here and were probably one of the reasons for the building of the many stone forts around Ireland. Torc Mountain in Killarney gets its name from an enchanted boar that was killed there by the legendary hero, Fionn McCumhail. Many of the stone forts built in Kerry were built as protection from wolves. The last wolf in Ireland is said to have been killed in the McGillycuddy Reeks in 1710. Left: Irish Red Deer. Right: Japanese Sika Deer. If all the above animals are dead and gone, what is left? Well Kerry is fortunate in having some animals that are special to the county. For example the Red Deer, a reminant from the last ice age over 10,000 years ago, still roams freely in the mountains above Killarney. A number of animals have been moved to one of the Blasket Islands to ensure their preservation. 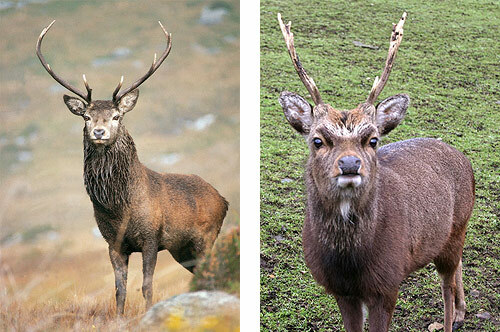 About 1812 three Japanese Sika Deer were introduced to Killarney. Today they number over 1,000 animals and have become important in themselves as they may be the only pure herd in the world. Another animal we are very proud of is the Kerry Cattle, said to be the oldest breed of cattle in Europe. Its ancestor is thought to be the ´Celtic Shorthorn´, brought by Neolithic man in his migration northwards from the Mediterranean. 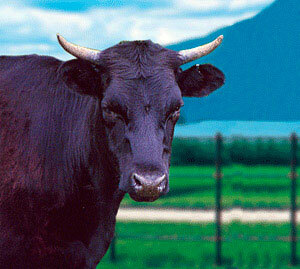 It has the distinction of being the first breed developed primarily as a milk producer, history´s first real dairy cow. As such these animals are part of our heritage. Ireland´s largest herd of these all-black cattle can be seen in Killarney National Park. Have you heard of the Kerry Blue? If you were a milkman or postman in Kerry you would certainly know all about this fellow. Although they only grow to about 18 inches, they make excellent watch-dogs. There are many other fauna that are special to Kerry – such as the Kerry Slug, the Natterjack Toad, and the Killarney rare fish – Shad and Char.